An essential task in any docketing system is the ability to quickly and easily enter information and retrieve info out at a later date. 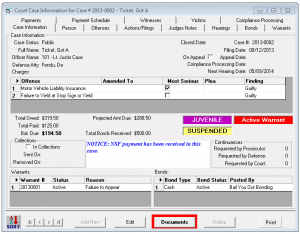 Jayhawk Court Software is simple and quick and makes court case tracking a breeze! 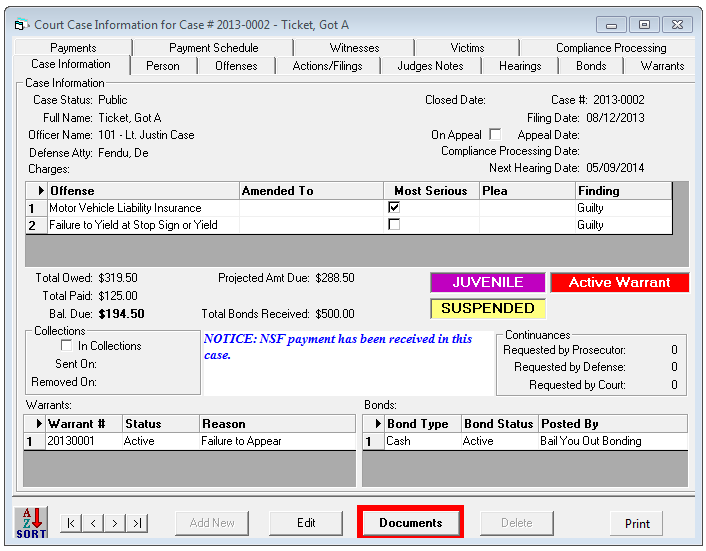 Jayhawk Court Software’s tabbed screens make locating case details and performing tasks easy with a click of a button. The offense table includes standard state traffic offenses and the ability to customize to your local ordinances. With automated compliance processing, failure to appear and failure to pay cases are easily managed. JCS’s comprehensive case management allows you to track offenses, dispositions, judge’s notes, hearings, warrants, suspensions and payments. JCS also includes customized reports and documents to meet all your reporting requirements. Below is a list of some of the documents that are included in JCS. There are even more than shown here! *Documents are auto-generated with the case information from JCS so you can easily create and print any documents from a case. Document lists, content and templates can be modified based on customer needs. **Reports are comprehensive, include state mandated reports, and can be modified based on customer needs.